The Homestead Half is a 20km high country fun run based on the Alpine Adventure/Mountainman run stage, with a bit extra added around the St James homestead paddocks and stock yards to bring the distance up to 20km. Earlybird entry now open, save 20% until end of Jul. Race start 11am start with briefing at 10:50am – the start and briefing will be on the Peters Valley track, at the end of the trees just past the foot bridge. Starting off the Peters Valley track the course heads across country to the first hill climb and then around the paddocks and through the stock yards before joining the multisport course and heading over to cross the Clarence River, from here runners will head up the river valley following the old transmission tower access tracks up toward the Edwards gate. Here runners will re-cross the Clarence River and enter the Edwards Valley. 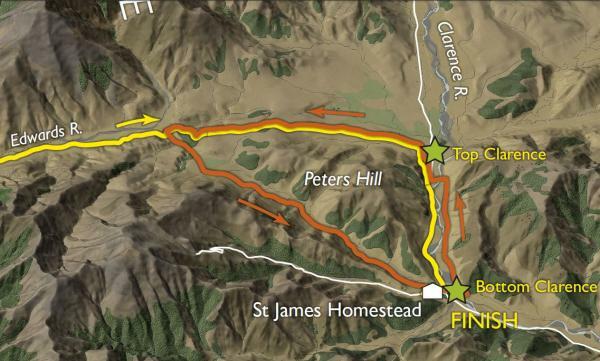 They will follow the 4×4 track over into the head of Peter’s Valley where they will follow the stock track back to the finish at the St James Homestead. Competitors can expect very hot conditions – be prepared and stay adequately hydrated. There will be an aid point in Bull Gully (approximately 14.5k mark) with EM’s goodies, R-Line, water, banana’s, sunscreen & crampstop) but this is remote country so all competitors will need to be self-sufficient – all rivers & creeks should be ok to drink from directly. All Competitors must attend the race briefing – Race briefing will be at 10:50am with the race start at 11am.